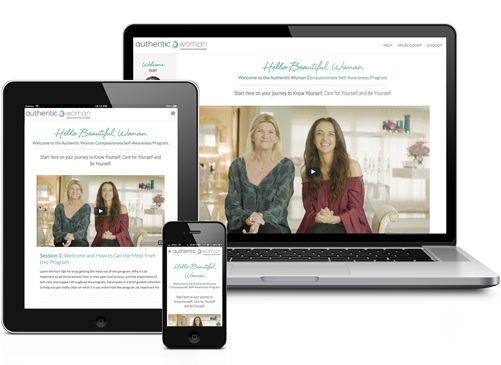 The Authentic Woman Program is a unique online on demand learning program, based on brain-science, for women wanting a step-by-step path for change toward more authenticity, calm and inner confidence. This Compassionate Self-Awareness Program is designed for women who want to transform how they feel about themselves, their relationships and their lives. To feel more authentic, calm and inner confidence. To be true to themselves. To thrive. At work. In life. Scientific evidence based practises to rewire your brain and bring more inner calm, confidence and connection. To thrive. This is the inner work. Through a unique online learning program based on brain science and proven ways to bring about inner and outer change. To empower you to thrive. This program is powerful. Really powerful. Whilst I have been on an ‘inner journey’ of self-awareness and self-discovery for over 20yrs, I found Authentic Woman profoundly inspirational and transformative. The fact that it’s underpinned by neuroscience and proven research really helped me to feel ‘justified and motivated’ in putting my time into what was suggested. Each session had such gold in it for me. It has been a deeply nurturing and nourishing experience. 22 evidence based video learning sessions, tools, practices, gentle wisdom, stories, downloadable resource, support and a private community. I’m the mum of a teenage boy and spent 20 years in corporate leadership roles before embracing my own Compassionate Self-Awareness journey. I re-trained, studied psychotherapy and coaching and became a Search Inside Yourself Accredited Teacher. I am passionate about empowering all women to thrive. To find their voices, be themselves, care for themselves and create deeply authentic and fulfilling lives. I’m a mindfulness-based psychotherapist and mindfulness teacher with a decades-long career in the corporate world that taught me much about the challenges of authentically being myself. I’m passionate about sharing the path of Compassionate Self-Awareness which has been, and continues to be, the most transformative path for living a deeply authentic and meaningful life. High quality videos with evidence-based learning, tools, practices, gentle wisdom and stories with Authentic Woman Co-Founders Jo Wagstaff and Heather Albrecht. Proven practices, tools, worksheets, books, reflections to support and empower your learning and experience. Weekly emails to inspire and support you on your journey to authenticity – feeling more confident, calm and connected. To thrive. Membership to the Authentic Woman Private Facebook Group, where you connect with your teachers and tribe to share insights, questions and experiences. Experience friend power versus will power. For each video learning session you will receive both a downloadable PDF transcript and audio file. 22 evidence based video learning sessions, tools, practices, gentle wisdom, stories, beautiful downloadable resource, support and a private community. To be ourselves we must first know and be-friend ourselves. We unconditionally guarantee your satisfaction with all Authentic Woman Programs for 30 days from purchase. If you are not 100% satisfied with this Program for any reason simply provide us with your receipt for a full refund.